"A quick baked salmon dish." Preheat oven to 450 degrees F (230 degrees C). Combine water and lemon juice in a bowl. Arrange the 16 smaller pieces of butter in 2 rows on a baking dish and top with garlic slices. Place salmon fillets over each row of butter and garlic. Melt remaining sliced butter in a bowl with minced garlic, about 40 seconds. Spoon about half the melted butter-garlic mixture over salmon and top with lemon slices. Pour about half the lemon juice mixture into the baking dish. Bake in the preheated oven for 10 minutes. Baste fillets with juices in the baking dish, then pour remaining butter and lemon juice over the fish. Continue baking until salmon is easily flaked with a fork, about 10 minutes more. 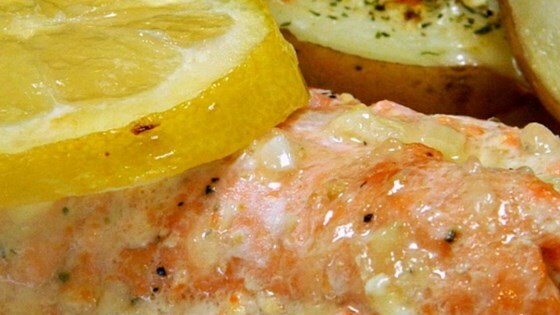 Best home salmon recipe I have used. The cooking time is great, the salmon is moist. The seasoning causes great mixture of taste and excellent to put on the rice. I shall do this again. Flavour was good. But not sure we need that much butter. I expected more from this recipe.